How does Tymlos (Abaloparatide Injection) work? Tymlos works by preventing the damage of bone material by cells called osteoclasts. This also works by lowering the risk of having a fracture. This injection contains a synthetic form of a natural human hormone which is parathyroid hormone (PTH). It is working by causing the body to build new bone. This medication does not build bone indefinitely. It also increases the strength of the bone and the thickness (density) of the bone. Why use Tymlos (Abaloparatide Injection)? Tymlos contains Abaloparatide which helps to decrease the chance of having a fracture of the spine and other bones in postmenopausal women. This happens when the bone is already thin and weak. This medication is approved by the U.S. Food and Drug Administration (FDA). This is available here at its affordable price. How to use Tymlos (Abaloparatide Injection)? Before using Tymlos Injection, clean first the injection site with rubbing alcohol. The recommended dosage for this medication is 80 mcg subcutaneously once a day. Follow promptly the prescribed dosage of your doctor. Take it at the same time on what the doctor has given you. Do not double the dose of this medication and of your other medicines. 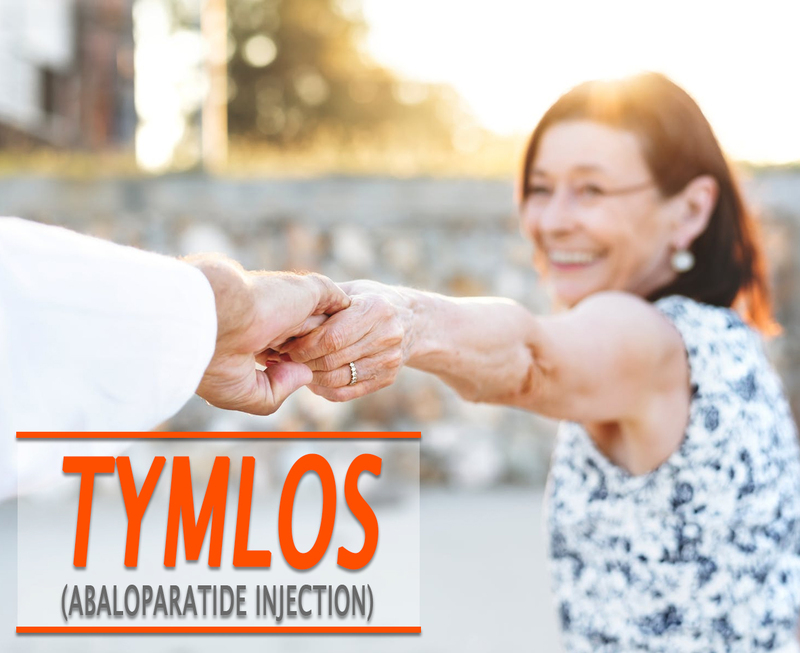 What are the side-effects of Tymlos (Abaloparatide Injection)? If these side effects persist or worsen, seek for medical attention right away. Before taking Tymlos, inform your doctor about all of your medical conditions and if you have a medical history. This medication is not recommended to use for more than 2 years during their lifetime. This should not be used in young and children adults whose bones are still developing. Do not store this with the needle attached and always keep the pen cap when it is not using. Do not use this for any other medications. Do not expose Tymlos to heat. Do not freeze. Keep this away and all your medications away from the reach of children.